Retail brokerage Fidelity said Friday it has temporarily blocked customers from buying some volatility-related products that caught hedge funds and individual investors on the wrong foot this week. Fidelity halted buy orders for three exchange-traded products linked to a popular trade on market volatility “to protect customers from outsized risk during the current market environment,” the company said in a statement. One of those securities, which has gained notoriety in this week’s stock market plunge, is the VelocityShares Daily Inverse VIX Short-Term exchange-traded note (XIV). It fell about 85 percent in after-hours trading Monday, prompting the issuer, Credit Suisse, to say it would end trading in the security on Feb. 20. 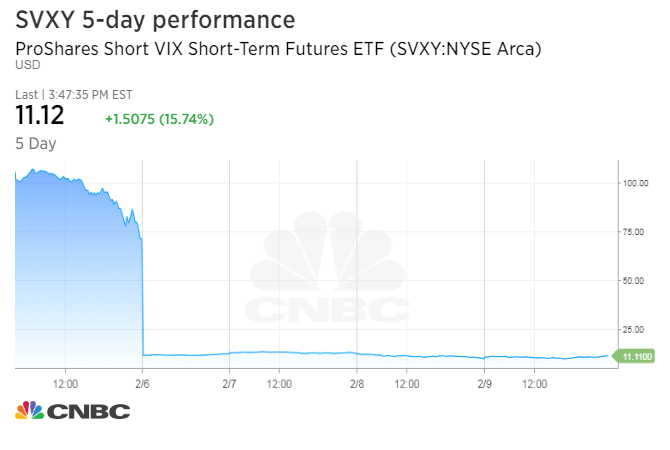 Fidelity is also blocking purchases of the ProShares Short VIX Short-Term Futures ETF (SVXY), which dropped nearly 83 percent Tuesday but was trading 10 percent higher Friday. Cboe executives said Friday on an earnings conference call that the ProShares fund was benefiting from a surge of investor inflows, since other funds for the short-volatility strategy are shutting down. SVXY assets have risen to more than $650 million from $100 million in just a week, the executives said. Fidelity customers also can’t buy VelocityShares Daily Inverse VIX Medium-Term ETN (ZIV), which is down 23 percent this week but up 5 percent on Friday. In order to buy these funds at Fidelity in the first place, customers need to sign a designated investment agreement and must have “most aggressive” risk tolerance registered on Fidelity.com, the brokerage said. More than a year of historically calm markets made betting against volatility a very popular trade. But worries about rising interest rates sent stocks tumbling in the last week, while the Cboe Volatility Index (.VIX) surged to its highest in more than two years. Some market analysts have also blamed the heavy bets against volatility in the exchange-traded products for exaggerating moves in volatility futures, and even the broader stock market. LJM Partners, a Chicago-based hedge fund with about half a billion dollars in assets, told clients Tuesday that its strategies “have suffered significant losses,” primarily due to a bet on the wrong side of spiking volatility. — CNBC’s Liz Moyer contributed to this report.